Stuffed Peppers are a traditional dinner meal that most all home cooks are familiar with preparing. However, I’ve most commonly seen stuffed peppers prepared with a meat-and-breadcrumb mixture – at least, that was how my grandmother and also my mother prepared them, and taught me how to cook them. Yet it’s an easy dish to adapt as an entirely vegetarian yet still extremely satisfying meal, whether you follow a strict vegetarian lifestyle or simply enjoy “Meatless Mondays” for variety and good health. Eggplant is a great substitute for a meat-based stuffing for peppers, particularly when one can find the delightful and sweet Romanesca or Rotonda Bianca Sfumata di Rossa Italian heirloom variety. These are becoming increasingly popular in Southern New Jersey where I live, with more and more farm stands offering this tasty eggplant for sale in the summertime. You can also buy Romanesca Eggplant seeds from suppliers such as Seeds From Italy. 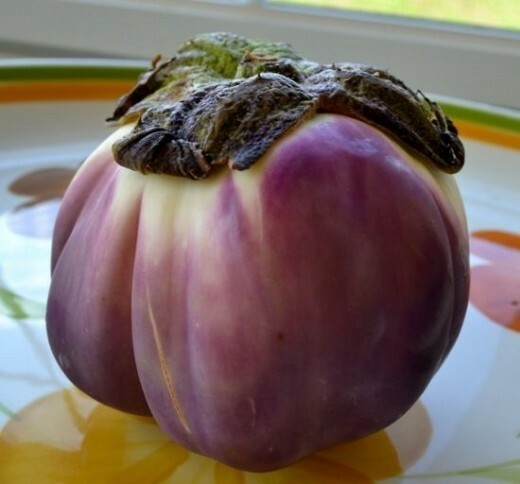 I used this type of eggplant, along with some fresh roasted oxheart tomatoes from my own garden, as the base for my Stuffed Peppers in the following recipe. Give it a try yourself some time, and I bet you’ll have a new favorite recipe for those summer nights when fresh garden produce is at its finest. 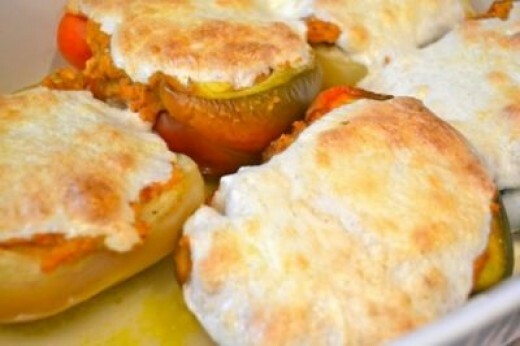 Lovely Rosa Bianca eggplant…my favorite variety for cooking. Although this recipe will work with any variety of eggplant, I am partial to the sweet, rarely bitter, mild flavor of the Romanesca variety. The firm flesh is perfect for many uses, from grilling to frying to baking. 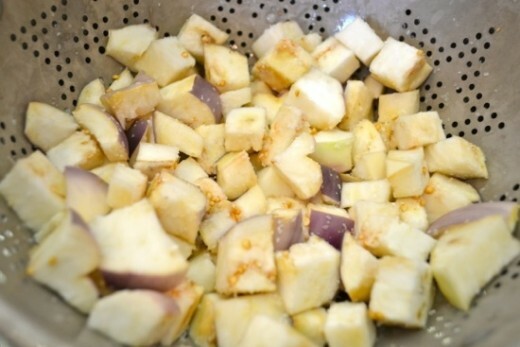 If using standard, dark-skinned eggplant I would recommend peeling the eggplant before dicing and salting. The skin on the Romanesca eggplant are not as thick, so it is fine to leave it on for this recipe. 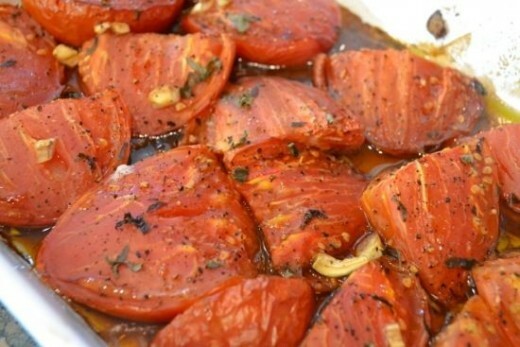 The roasted tomatoes used in the filling. 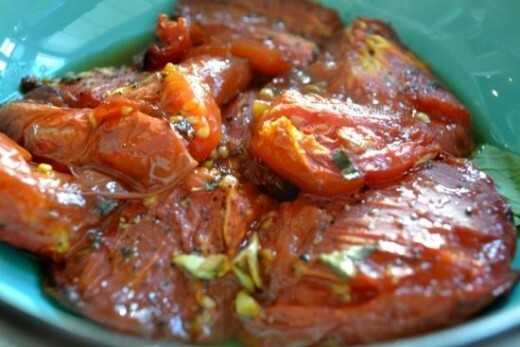 You can prepare the roast tomatoes ahead of time, so that you can save time in the kitchen – I like roasting up a lot of tomatoes on the weekend so I have them to enjoy for several days during the week. Roasting is a great way to intensify the flavor of the tomatoes and use them up if you have a lot coming in to your garden on a regular basis. Any leftover roast tomatoes from this recipe can be enjoyed as a simple pasta sauce, on sandwiches, or as a healthy snack all on their own. 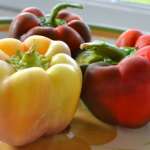 I like serving a bowl of them on the side with the stuffed peppers along with some fresh-toasted Italian bread. Since I was only cooking for my partner and I, there was no need to prepare more than three peppers for a weeknight meal (and I still had some leftover for lunch the next day.) 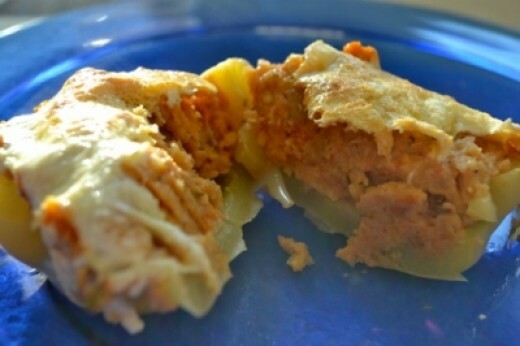 You can of course double or even triple the amounts in this recipe as needed for the number of people who will be at your dinner table. 1. Preheat oven to 300°F. Slice the tomatoes in half and arrange them in a shallow baking pan or casserole, cut side up. Drizzle with 3 tablespoons olive oil and 2 tablespoons balsamic vinegar. Season with salt, red pepper flakes, black pepper, minced garlic and fresh oregano. Roast in oven, uncovered, for 90 minutes or until the tomatoes are nicely softened and just starting to blacken. 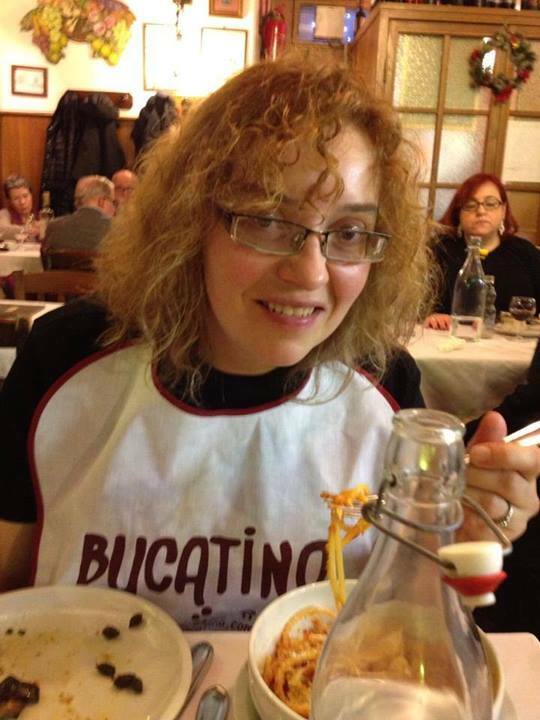 Meanwhile, dice the eggplant into small cubes, place in colander over a bowl and sprinkle generously with sea salt. This will release any bitterness from the eggplant along with excessive water. Leave eggplant for 60 minutes, then rinse off salt and dry. In a sauté pan large enough to fit the eggplant, heat 1/4 cup olive oil. Add eggplant and cook for 4-5 minutes, until just starting to brown. Drain off oil and purée until smooth. Wait for the tomatoes to finish cooking, if necessary. When tomatoes are ready, remove from oven and increase oven temperature to 350°F. To the eggplant, add panko breadcrumbs, basil, egg, and at least 1/2 to 3/4 cup of the roasted tomatoes. Blend in food processor and adjust seasoning as you wish. Depending on the moisture of your stuffing and the flavor, you may wish to add more tomatoes or breadcrumbs. 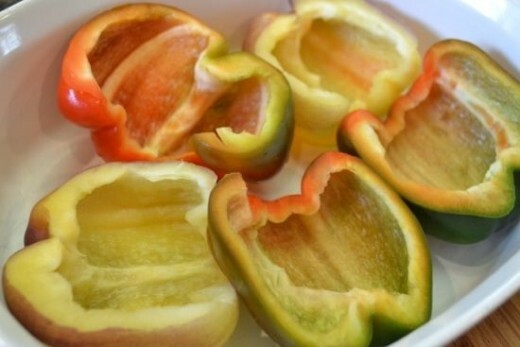 Prepare the peppers for stuffing by cutting in half lengthwise, then removing stems, core and seeds. Arrange them in a high-sides casserole dish, cut side up. Use a dish just big enough that the peppers will fit together in a snug arrangement. 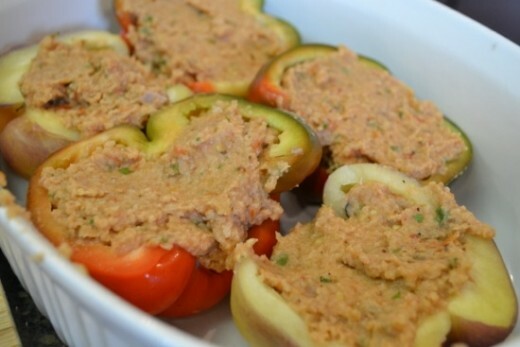 Fill each pepper with stuffing, then top with a slice of mozzarella cheese. Drizzle additional olive oil on top, and add several tablespoons of water to the bottom of the casserole dish. 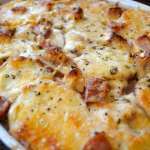 Place in 350 degree oven and bake, uncovered, for 40-45 minutes – until the mozzarella cheese is melted and starting to brown. 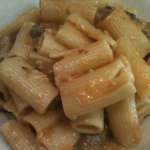 Remove from oven and serve family style in casserole, along with crusty Italian bread and the rest of the roasted tomatoes. 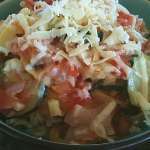 This entry was posted in Cooking and tagged cheese, eggplant, peppers, stuffed peppers, summer vegetables, tomatoes, vegetable recipe. Bookmark the permalink.